Lucifer takes a break from the established dynamics when Dan and Lucifer work together on a case and Ella takes charge of planning Chloe’s bachelorette party. Overcoming fear is at the heart of this episode in a lot of ways and the show explores this in wildly different ways. Lucifer’s biggest issue is that he can’t understand why Chloe would accept Cain’s proposal and he makes it his mission to figure that out in the most convoluted way possible. Instead of having a mature, honest conversation with Chloe he decides that it’s better to try to get inside her head by imitating her in the hopes that this would further his understanding of how her brain works. It’s just the sort of ludicrous plan that only makes sense to Lucifer and it plays out in typically ridiculous fashion. Pairing Lucifer up with Dan is always a lot of fun because of their very different yet equally entertaining dynamic. With Lucifer trying to be more like Chloe -complete with a wardrobe change and a more normal car- that means Dan looks to behave more like Lucifer. The results are mixed but it just goes to show how different these characters are. Dan’s established affiliation with an improv group doesn’t really help him here and it’s amusing to watch him embarrass himself in a dive bar trying to be more like Lucifer. Dan’s change in role does pay off when he does the typically Lucifer thing of sneaking into the murderer’s home throwing all concept of personal safety out the window and choosing to confront him directly. 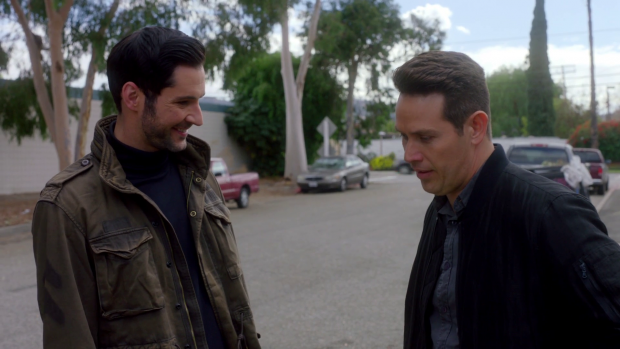 Amusingly Dan solves the case through actual intuition and police work despite Lucifer claiming that he is in charge of the investigation. Lucifer’s attempt to channel Chloe is also amusing and completely misguided. His main problem is that he doesn’t see her as anything else than her job because that’s the main way he interacts with her. Dan is the one to point this out paying extra attention to Lucifer’s insistence on calling her “The Detective” rather than her actual name. Lucifer sees this as endearing but it’s basically a very dehumanising thing to do. He can’t seem to understand her outside of the confines of her job and is convinced that the decisions she makes while at work inform the decisions she makes in her personal life. It’s painfully naive, very misguided and shows that he doesn’t know Chloe as well as he thinks he does. All he basically does is copy what she does during a case such as questioning people and pointing out that he’s showing empathy because that’s what Chloe would do. Similarly he is quick to pull guns on people and call in backup but he is still unable to understand why Chloe does these things and that in a nutshell is the root of his problem. He sees Chloe in 1 dimensional terms and won’t ever be able to truly make sense of how she behaves in his own head until he stops doing that. Despite Dan pointing this out in very simple terms to him he fails to learn the lesson despite the penny seeming to drop on what Chloe actually means to him and his dynamic with her resets to the partners in solving crime setup we’ve had pretty much since day one. It really isn’t the most engaging case of the week and has a very tenuous link to the thematic throughline of the episode. A dog show murder should have been a lot more fun than it was but it unfortunately becomes bogged down in irrelevant details and is completely overshadowed by the more character driven aspects. This is nothing new for the show but returning to the actual case details that weren’t connected to the role alterations for Dan and Lucifer dragged the episode down some. In terms of overcoming fears this is something that Dan does when he talks to Charlotte and confesses that he’s tired of messing around and wants something serious with her. It goes really well for him and they share a passionate moment together indicating that their relationship is progressing in a direction that may be considered healthy. Since Lucifer never learns his lesson he fails to realise that he’s afraid to simply confront Chloe about her decision and accept the way he feels about her. He mentions to Amenadiel that the opportunity was missed and that seems like enough of an excuse for Lucifer to let it lie. He’s clearly in a serious case of denial and this episode indicates that he’s not about to shake himself out of that. Even when he seems ready to confess his feelings he stops himself once he has the slightest excuse. Arguably it’s out of respect for Chloe potentially not being ready to hear it after the end of her engagement though if one thing is well established it’s that Lucifer will take any opportunity to hide from his true feelings. Chloe’s engagement to Cain stirs up a lot of insecurities for her as well as others. I mentioned last week that it was a very abrupt decision and completely out of character for Chloe. This seems to form the basis of her arc for the episode. The wedding will take place in three weeks because neither Cain or Chloe want to wait any longer than they have to. For Chloe this means a whirlwind of planning and quick decisions designed to never really let it sink in that she has agreed to marry someone she basically barely knows. It turns out that she accepted the proposal because she is trying to be uncharacteristically spontaneous in an effort to reclaim something about herself that she feels has been lost. When looked at on its own it’s actually a fairly morbid admission that feels consistent with the uptight attitude that helps define the character. The episode is basically building to the point where she has time to reflect on her decision and let rationality step in. She breaks off the engagement to Cain without really going into detail as to why that is though the reasons are made clear by Chloe’s discussion with the bus driver and her general behaviour throughout the episode. I suspect there will be fallout from this in the following episode but leaving it on a semi ambiguous note was the right call as it keeps the drama to a minimum. 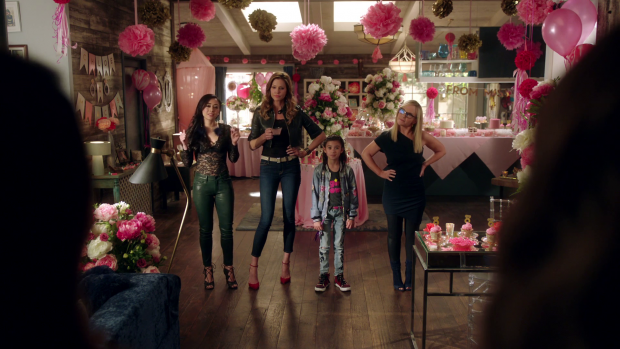 Lucifer is a show that always manages to balance fun with more serious elements and there are few better examples of this than the bachelorette party. Ella takes it upon herself to organise a night of debauchery because having four brothers means that she has never been able to experience that and sees this as her chance to make up for lost time. Once the case of the week gets more intense Ella is forced to step back and leave the organisation to Maze who should be the queen of debauchery. The results are the opposite of what you might expect as Maze creates the tamest bachelorette party that anyone could ever imagine and dresses more conservatively than she ever has. Why she does this isn’t quite clear. Everyone assumes that it’s torture of some kind though Maze says that she’s giving Chloe what she always wanted which suggests that she doesn’t really know Chloe all that well. Either way it’s unclear what Maze is up to exactly though I suspect it has something to do with proving that her feelings for Cain are genuine enough to remove the mark. Once again I’m still not sure why Chloe falling in love with Cain removes the mark but it at least makes sense in terms of Maze’ desire to return to Hell. Charlotte is the bad influence using all of her connections to deliver the debauchery that Ella wants in an amusing display of decadence. Maze and Charlotte make up a version of the Angel and Devil on Chloe’s shoulder which definitely proves amusing. Seeing Maze frown disapprovingly at the other women having fun is hilariously unexpected and the bachelorette party scenes are fun in general especially when Linda and Maze almost come to blows indicating that their friendship is well and truly over. I really liked Charlotte’s contribution as she continues the mission to break Chloe and Cain up because Amenadiel asked her to. She does this by helping Chloe have a good time and lowering her inhibitions enough to be receptive to the seeds of doubt that Charlotte begins to sow. She terrifies Chloe with divorce statistics. Charlotte believes that this brings her closer to her goal of gaining entry to Heaven so is very eager to carry out the plan whether she believes that it’s the right thing to do or not. It ties into her constant struggle to be a better person and makes her an important part of the episode because her efforts probably go a long way towards helping Chloe make her decision. Maze and Cain’s plan is given some lip service by showing that Cain is faking still having the mark so that Maze doesn’t try to murder him. She is still fully committed to carrying out the plan but needs Cain to become mortal before she does this despite Cain’s insistence that he’s in love with Chloe and doesn’t want to die any more though he does promise to help Maze find a way back to Hell. It’s a complicated road that the characters are about to tread and Maze figuring out what Cain has been doing appropriately raises the stakes. In many ways Maze is the villain of the piece with her motivation being that she has no idea how to process how she feels. A strong episode that has a strong thematic throughline concerning characters facing their fears. 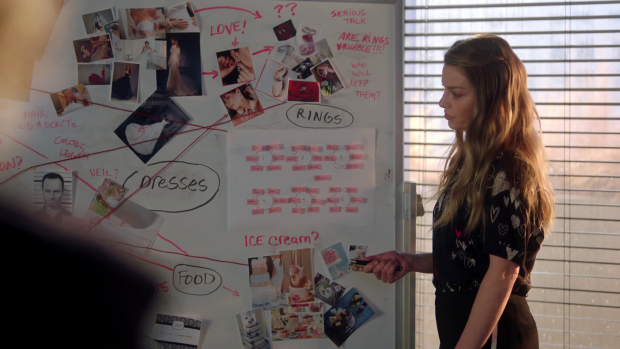 Instead of facing his Lucifer decides that the best way to understand Chloe is by imitating her rather than having an actual conversation with her designed to express his feelings and find out why she makes certain decisions. 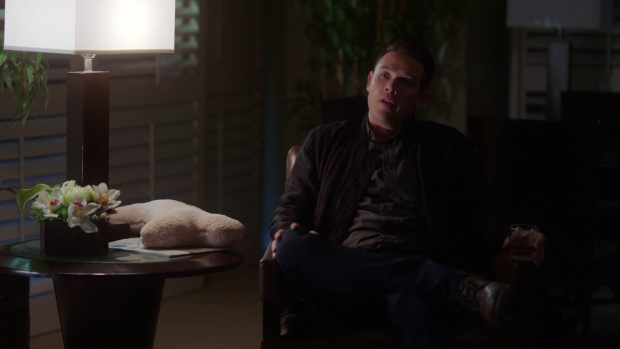 Dan points out the 1 dimensional way he sees Chloe and how that’s a barrier to that relationship but Lucifer refuses to learn that lesson despite seeming to get it by the end of the episode. He takes any opportunity to deny his true feelings and revert back to his established dynamic. Seeing him channel Chloe was definitely amusing as was seeing Dan unsuccessfully try to channel Lucifer until he succeeds to some degree. Dan does show an ability to face his fears when he tells Charlotte he wants a serious relationship with her. Chloe’s impulsive decision to accept Cain’s proposal turns out to be a deliberate attempt to be more spontaneous as she laments the loss of that part of herself. Once she has time to reflect on that decision she decides that isn’t what she wants and the engagement breaks off. To minimise drama the fallout isn’t dealt with but presumably will be next week. Maze’s tame bachelorette party is amusingly counter to what would be expected as well as possibly showing her own lack of understanding of what Chloe wants from life. It could also be a form of torture as is theorised but it’s unclear. Using Charlotte as the bad influence is a nice touch as it ties into her plan to break Cain and Chloe up to get her closer to Heaven while creating some fun debaucherous situations. Ella is a particular highlight taking complete ownership of the situation -until she can’t- out of a genuine desire to have the fun she feels deprived of.